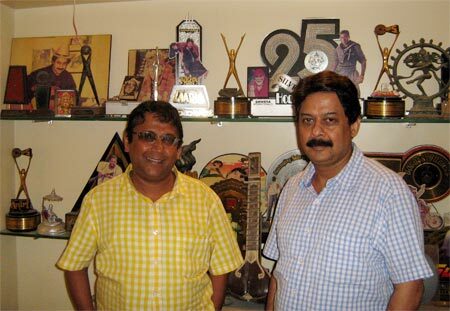 Music composer brothers Anand-Milind gave Bollywood a string of music blockbusters before fading out six years ago. From their first hit in Qayamat Se Qayamat Tak (1988) to Raja Babu, Coolie No 1, Dil, Beta, and many more, their music was very popular. They re-surfaced last week with the damp squib Yeh Khula Aasmaan. They have composed music for more than 250 films in Hindi and one in Telugu. Not many know that their father was the acclaimed music director Chitragupt. We know your music well; now tell us about yourselves. Anand: We, the Srivastav family, are from Bihar. We come from an educated background. One of my cousins lived in Austria. Another was the head of RAW. One was in the income tax department. Dad did his Masters degree in Economics. His elder brother was a famous journalist who used to write for Indian Nation in Patna. He was also the president of the Press Club there. Dad lost his parents at a young age so the elder brother took all the decisions. He wanted dad to work; he got a job as a lecturer. He worked for a few months but his passion was music. He used to sing patriotic songs in Gandhi Maidan in Patna. Those were the days of the Raj. Milind: My father learnt classical music. His was good at both Sanskrit and Urdu. Anand: Madan Sinha, who later became a famous cameraman and directed Imtihaan starring Vinod Khanna, was Dad's classmate. The two of them ran away to Mumbai together. Dad's elder brother was so upset that he cried and for many days did not eat properly. They came to Mumbai in the mid-40s where my dad was introduced to S N Tripathi, a music director who took him on as his assistant. After composing for 25 movies, they became partners and had a joint byline. Milind: A movie made by Homi Wadia was my father's first independent movie. Tripathi just gave it to him. The man was generous to a fault. My father gave music to lot of stunt films. Then AVM Productions (a leading South Indian film banner) had done a lot of movies with S D Burman. When they wanted to make a mythology, Burmanda told the AVM people to go to Chitragupt who had composed music for other mythological movies. He did around 200 films. What age did the two of you start composing music? Anand: We started when we were 23 years old. Dad was seriously ill and we helped him out. He survived by a miracle. He was bedridden for over 18 months. He recovered and went back to work. We went with him as he was not as strong as before. That's how we came to know the industry. Kishore Kumar had a soft corner for our dad. He gave him lots of songs and even sang duets with him. We began helping him and then started composing on our own. Do you argue with each other when you are composing? Anand: We argue regularly but because we are brothers, it is okay. When a producer comes to us and tells us the situation, we go home and the next day we both play the tune we think suitable. Then we choose what we think is better. Sometimes we play both versions for the producer and he chooses what he likes. Did marriage make a difference to your team? Anand: When I got married, I shifted before any issues started. Most fights start over money. We brothers are very honest with each other. My younger brother Milind deals with all financial matters. So there is no difference of opinion as I don't interfere. How has the music scene changed since you started 30 years ago? Anand: Those days there was mono recording. There were huge orchestras, 25 violins and 40 guitars sometimes. Everything was at one go. If a musician made a mistake, then the song had to be recorded again. Milind: I remember Lataji (Mangeshkar) coming out and asking 'Who made that mistake?' as she would have to sing the whole song again. She used to lift her glasses and glare at the musicians. They never made that mistake again! Then stereophonic sound started. Then from tape, it went to digital and from live musicians and orchestras to synthesisers. For a while, it was a mix of both. What has changed hugely is technology. Now they sing separately -- music is composed separately and then put together. Machines iron out all flaws in the voice or in the music. Anything jarring can be edited out. Anything can be added at any time. You have composed music for a Telugu movie. How do you do that without knowing the language? Anand: That was for Suresh Krishna with whom we had already made a Hindi movie. He used to explain the song and situation in Hindi. We composed it and then the song writer wrote the song according to the music instead of the other way around. You started in 1984 and in 1988, you got a Filmfare award. After that, for 24 years, no award. How come? Milind: We got many other awards, including a National award. After 1988, we were nominated for seven years but never won. How many songs have you recorded? Milind: It has been more than 250 movies so we must have done around 2,000 songs. Which songs are easy and which difficult? Milind: You cannot say this song is easy and another difficult. It becomes difficult when the director tells us that while the song is playing, there is another scene where maybe a man is walking or running towards the hero...some danger approaching. So first we do the song and in between we have to have music that says danger. This becomes difficult but we do it. Anand: Very difficult to choose, but I like Aye Mere Humsafar. From Qayamat Se Qayamat Tak all the songs. And Lal Dupatta Mal Mal Ka. What do you think of re-mixes? Anand: Re-mixes spoil the song. Most of it is very jarring. You have been accused of picking up tunes from A R Rahman and Illayaraja. Anand: Out of 1,600 songs that we composed there must be seven or eight that have been accused of plagiarism. We were forced by the producer and director. They just wanted to copy a particular tune that they liked. Today, I regret what we did. I should have put my foot down and refused. Milind: We did do a few films which did not run well. We kept ourselves busy composing tunes. By God's grace something happened. We did not starve. What is so special about Yeh Khula Aasman that made you take up the project? Anand: The subject was very nice. It is about four gangsters. It is about a grandfather and his grandson. There are three love songs and other music. Today, music directors are also writing songs and singing. Is this a good sign? Anand: I think it's a good sign as some of them sing very well. Which movie music have you liked recently? Anand: I liked the music of Jannat 2. I like Shankar-Ehsaan-Loy. They are superb and extremely talented. Sajid-Wajid also have a lot of variety. Rowdy Rathore is good; it's like the music of the 1990s. What changes do you see in the film industry today? Anand: Now there is corporatisation of the industry. Filmmaking is a passion. You cannot treat it like a product. So everyone, including the movie, suffers. What do you think about item songs? Anand: They were always there. Earlier they used to be called cabaret, striptease or some other name. Now it's called item song. Sad part is that awards are given for item songs. Earlier there were no such awards. What do you think about lifting songs from various sources? Milind: This used to happen before too but not so much. Now, because of the internet, you have access to a lot of songs in various languages and in various countries. Those days we did not know Korean and Chinese songs. How do you know what music will click with the audience? Anand: You can never guess that. Audience taste varies. You think they will like it and it does not happen. And they will like a song which you never thought will be a hit. What do you think was your best work? Anand: Qayamat Se Qayamat Tak. PIX: Bollywood gals with the SEXIEST backs! Get Aishwarya's Sensational Cannes Look NOW!